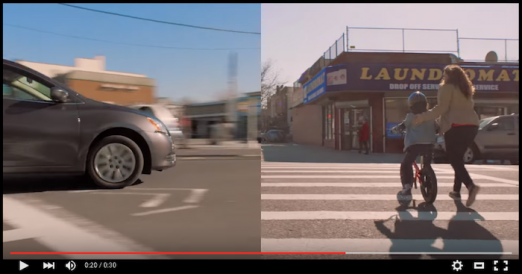 I was watching TV this morning, and realized that one of the city’s Vision Zero ads was filmed right here in Astoria! It’s a sad tale of a speeding car and a boy on his bike; it doesn’t end well but thankfully the ad spares us visions of any carnage. The collision would have happened on the corner of 31st Street and 21st Ave. The car’s path at the 9 second mark is, I think, on Crescent Street, but I can’t place it exactly; the Hell Gate Bridge trestle and two way traffic gives it away as Crescent. I was also made aware of this ad for Major World—you know, that used car business on Northern Blvd. I used to listen to 880AM and remember their screaming ads. This commercial features the Naked Cowboy from Times Square. And do you remember the NY Lottery ad that was filmed at MOMI? Other TV news is that Season 4 of Orange is the New Black is coming back to Netflix on June 17, 2016! We wonder how many Astoria scenes will be part of the show. ICYMI, see where they filmed in Astoria for Season 1 and Season 2. Do you know of other commercials that were filmed in Astoria? Let us know in the comments.